The Arab-Israeli conflict remains one of the most contentious in modern history, one with repercussions that reach far beyond the Middle East. This volume describes and explains the most important countries, people, events, and organizations that play or have played a part in the conflict. Chronological coverage begins with the Israeli War of Independence in 1948 and extends to the present day. A one-stop reference, the guide offers a comprehensive overview essay, as well as perspective essays by leading scholars who explore such widely debated issues as the United States' support for Israel and historic rights to Palestine.Important primary source documents, such as the UN Resolution on the Partition of Palestine and the Camp David Accords, are included and put into context. 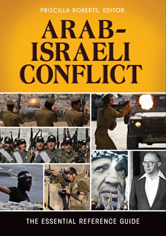 Further insight into drivers of war and peace in the Middle East are provided through biographies of major political leaders like Menachem Begin, Golda Meir, Yasser Arafat, Benjamin Netanyahu, and Anwar Sadat.